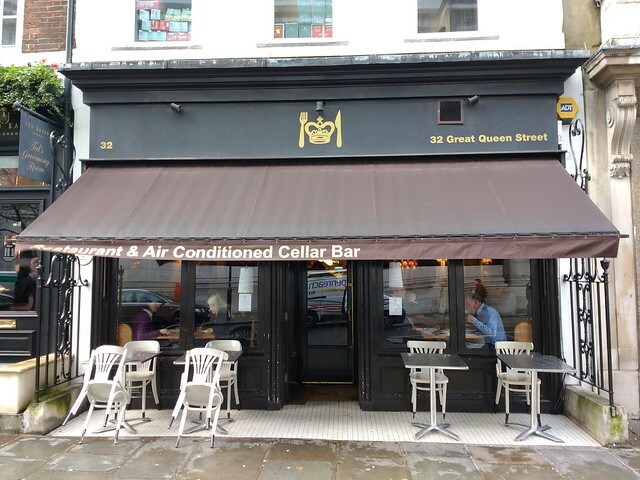 This week's featured article is Great Queen Street, WC2B 5AA. 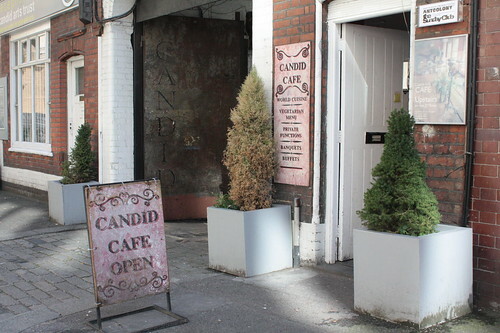 It's a restaurant and bar in the shadow of the Freemasons' HQ and has some great food even after all these years. Good for treating the parents. 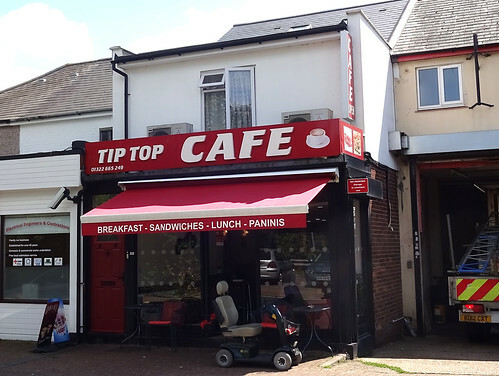 There's one new article, being Rio's Britannia Cafe in South London's Norbury. Does what a greasy spoon is supposed to do, albeit without pork. 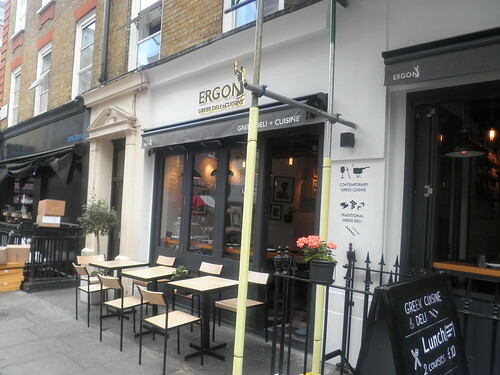 Our reported permanent closure this week is Ergon, a Greek restaurant and deli in Marylebone. Evening all! 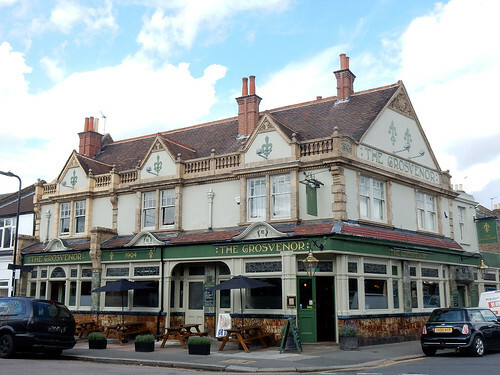 This week's featured article is the Grosvenor in Hanwell, a large Good Beer Guide pub with decent food (their website features a picture of some delicious-looking toad-in-the-hole) and some nice old-fashioned tiling on the exterior. 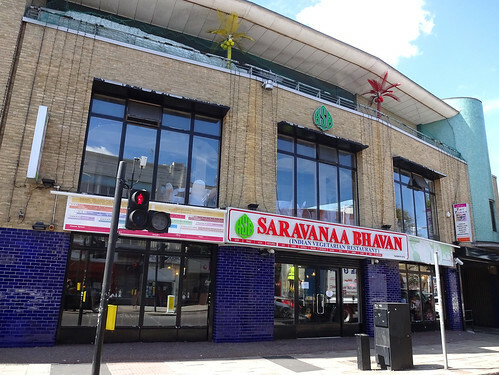 New to RGL are Karahi King and the Preston, both in Wembley. 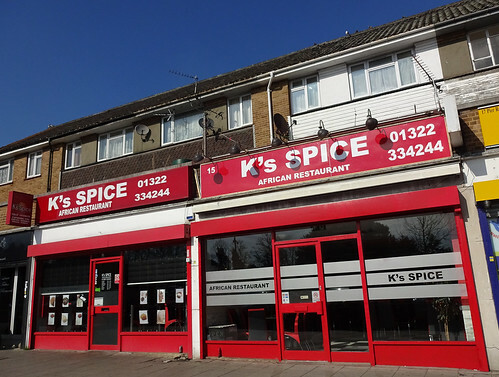 Karahi King is a laid-back Indian cafe where you can bring your own booze, while the Preston makes up for its Ember Inns blandness with free lime and soda and generally good accessibility. 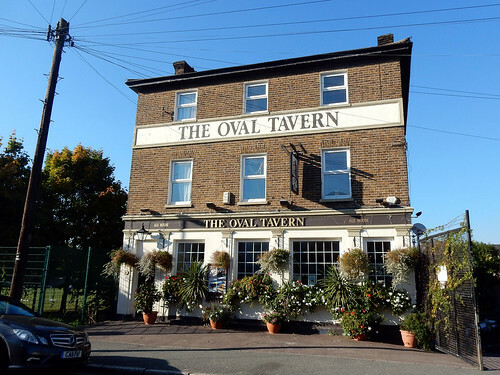 The article for the Oval Tavern in Croydon has an update following a visit. Although it's not the closest pub to East Croydon station, it looks like a decent place to spend some time waiting for your train. 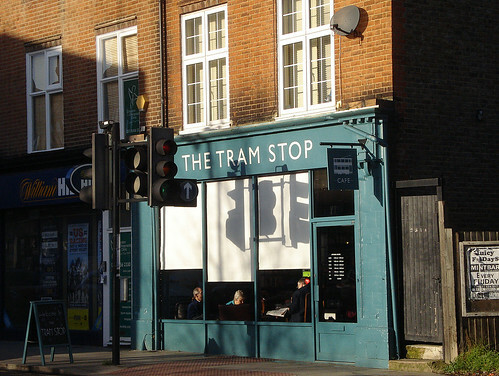 Pubs you should not wait for a train inside, as they have recently been on fire: the Beehive near Baker Street and the slightly less swanky New Cross Turnpike in Welling have both temporarily closed while they pat out the flames. 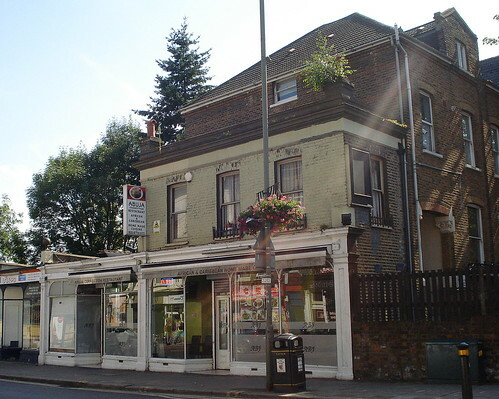 Meanwhile the Ravensbury in Mitcham is not on fire but is also temporarily shut while its new owners figure out what to do with it, and the Fitzroy Tavern (which I feel I must point out is in Fitzrovia) is having a major refurb, and due to reopen next summer. Doctor Who fans will have to find somewhere else to meet up for now. 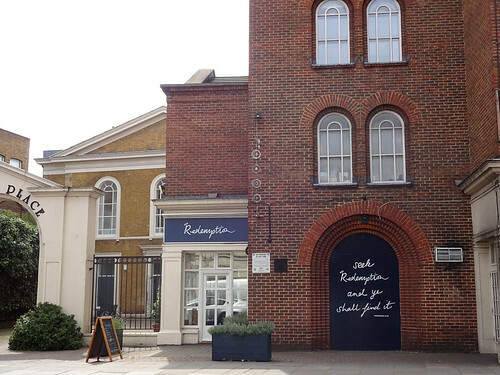 Finally, Sam's Brasserie and Bar in Chiswick has shut, to be replaced by a branch of Foxlow (owned by the Hawksmoor dudes). I am not keen on Foxlow as a brand, through no real fault of theirs - they replaced Homa in Stoke Newington which did extremely awesome takeaway pizza, a fact I only found out about just before they shut for good! Foxlow are clearly to blame for me not paying attention to local pizza opportunities for the previous 8 years. 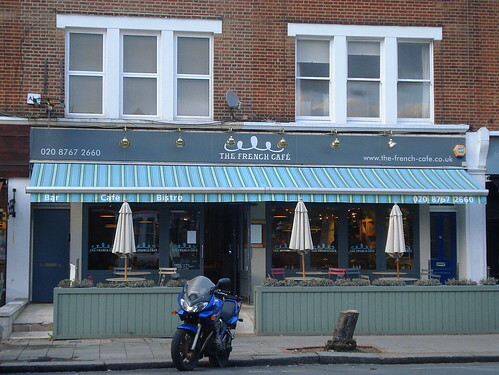 This week's featured article is for the French Cafe, just off Balham High Road. It's a modern establishment that does cuisine française, as you might expect. I've been trying to learn French recently, and with a bit of help from Google Translate I can tell you that le pâté there is tres bon although le pain is rather less than génial. C'est la vie! 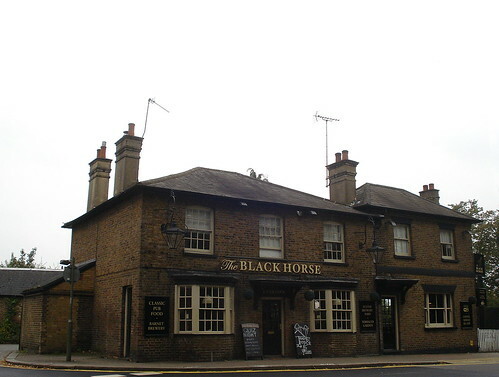 There's a new article for the Langthorne, a pub in Stratford that's part of the Stonegate chain. It won't charge you over the odds for a lime and soda, but it's a bit loud inside. Mes oreilles! 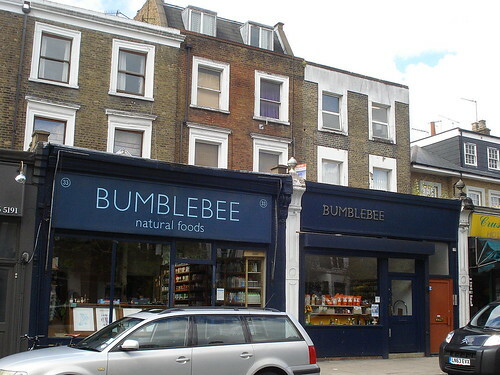 Veggie-friendly Cafe Crema in New Cross has been sold to a new owner, but we're not sure yet if this has meant drastic changes or business as usual. Qui sait? Finally, the Pontefract Castle in Marylebone has closed - another pub building seemingly destined for luxury flats. Des vaches maigres! 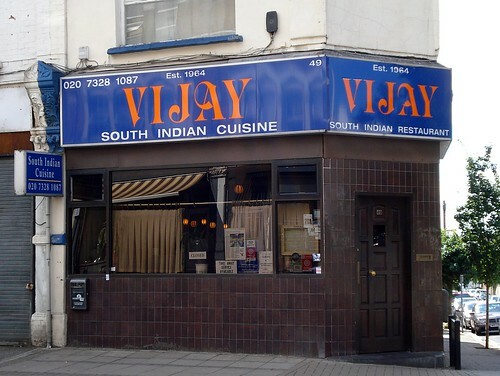 There are updates to the articles for the George pub and Mirch Masala (both in Croydon), and the Riverside Bookshop has moved a few yards from Hay's Galleria to Tooley Street. Meanwhile, Swedish haunt The Harcourt has closed for refurbishment until June 2015, and has relocated to the nearby Duke of York (so Eurovision fans will still have somewhere to watch Melodifestivalen this spring). A whole bunch of closures to report: the clanging chimes of doom have clung for the Marquis of Wellington and Royal Delight (both in Bermondsey), the Iron Duke inside Victoria station (now replaced with The Beer House Victoria - you can probably guess what font its sign uses without even clicking), the Hobgoblin in New Cross (now reopened as the Rose Pub & Kitchen), Broca Food Market in Brockley, Books For Amnesty in Hammersmith, the Duke of Edinburgh in Upton Park, and the Prince of Wales in Hillingdon. I don't think you could have watched Melodifestivalen in any of those places. Afternoon all! I hope you had a good long weekend. 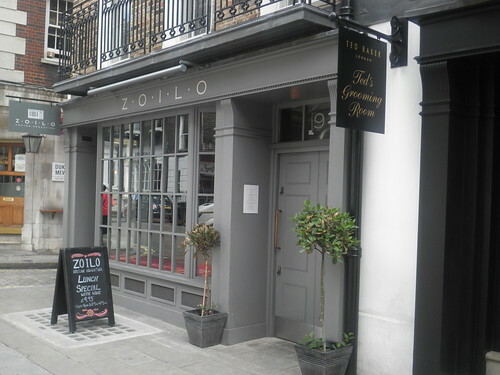 This week's featured article is for Zoilo, a smashing Argentinian restaurant in Marylebone near the Wallace Collection. The wine list is interesting and the empanadas are excellent - if you're going for lunch, make sure you don't have to go back to work afterwards. Your contributors have been busy this week: we've got new articles for Franco Manca, a branch of the sourdough pizza chain in Westfield Stratford City; the new-ish Baker Street branch of the Natural Kitchen, which has plenty of unhealthy options to choose from; Bumblebee Natural Foods (an independent grocers and bakery) and Kami (a Japanese restaurant), both in Kentish Town; and - long overdue for a write-up, considering how often I go there - the 24-hour Bagel House in Stoke Newington. I can recommend the £1 pizza slice as a satisfying late night snack. 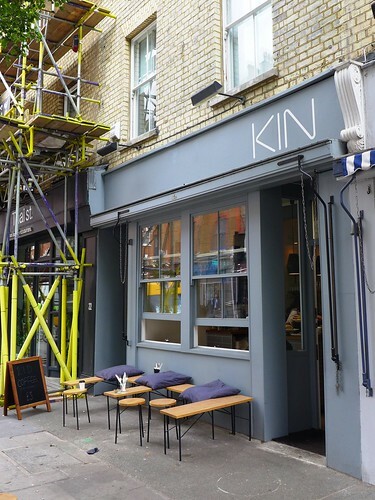 Kika in Canonbury has closed and is now a cafe called The Fig Tree. Finally, although we don't have an article for it yet, it may be useful to know that the Phoenix bar in Cavendish Square (near Oxford Circus) is temporarily closed for refurbishment, reopening in early September 2014. Hello from your belated RGL updates team! If you're like me, you may be thinking that the featured article this week is some kind of Scandinavian design consultancy (my mind goes straight to "ergonomic", which sort of suggests that kind of thing, but maybe that's just me). Well, fear not, for Ergon, W1U 1BP is a Greek restaurant and deli in Marylebone. It's pretty good value according to my fellow correspondent, but keep an eye on what you're being served. 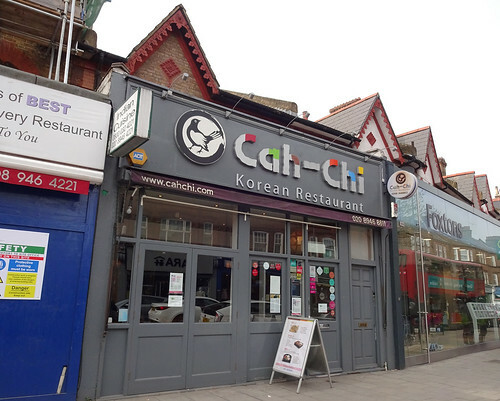 We have two (albeit related) new articles: one for the Broca cafe in Brockley, home of perky jazz, good service and tasty thick-cut sandwiches; the other for Broca Food Market, a hippy food shop on the other side of the tracks (literally), but run by the same people. Following refurbishment, the Imperial War Museum in Lambeth has reopened. 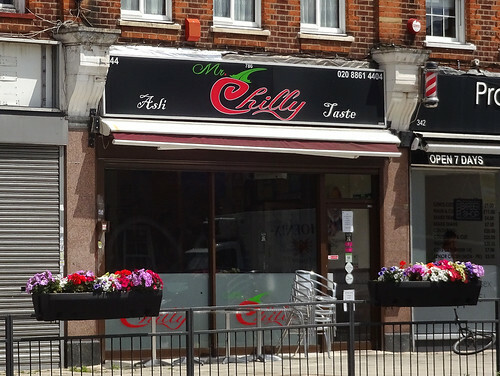 Finally, Nivla Restaurant in Camberwell has now closed, so you will need to do further research for your Sierra Leonean eating options in London.